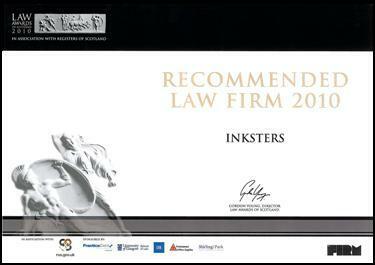 Inksters Solicitors have, for the second year running, achieved Recommended Law Firm status following independent research carried out by The Law Awards of Scotland. The research involved The Law Awards of Scotland speaking to our clients and peers and scoring us on matters such as value for money and accessability. Inksters is one of only 64 law firms in Scotland to have been accepted into the register of Recommended Law Firms. Brian Inkster said "I am once again delighted to receive this endorsement which is independent recognition of the efforts we make at Inksters to provide legal services to our clients in a way that is Just that little bit different."